I had a chance to visit one of the seven wonders of the world, the Great Wall of China! And let me tell you, that it lives up to the name. While the day was hot and a bit rainy for a while, we were still excited to see the famous Great Wall. While I originally thought I was prepared, I wasn't nearly as prepared as I thought for the tiring walk. We woke up bright and early to head to the wall, since it was a long drive from the hotel to the Great Wall. The road there was windy and hilly, making it even longer. By the time that we arrived, it was about nine or ten in the morning (I can't remember exactly), so there was still plenty of time to explore. History corner: The Great wall of China, originally build to keep invaders out of the capital city, winds up and down deserts, grasslands, mountains and more. It spans for about 5,500 miles and is over 2,000 years old. It begins in the east, in the Hebei province and finishes at Jiayuguan in the Gansu province in the west. 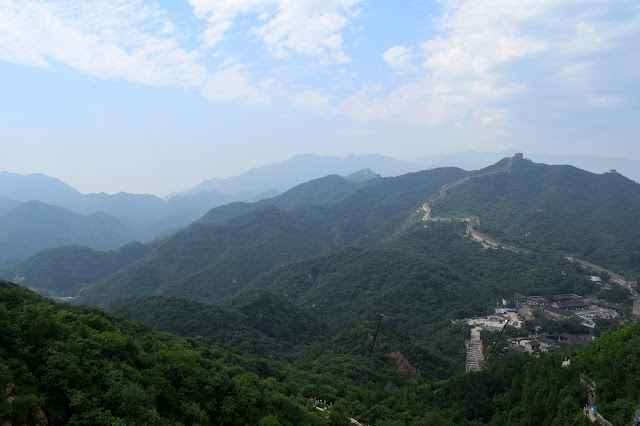 The warring states originally built up large walls, but the Great Wall wasn't actually formed until the Qin dynasty. The Han and Ming dynasty also contributed to the wall, building more upon it and also repairing it. Today the Great Wall is still repaired, but since it spans such a great distance, some parts are repaired better than others. For example, the area where the tourists walk is very well maintained, making sure that the trees are not overgrowing onto the wall. The wall allowed the city to not only be more protected, but allowed for a lookout so that the soldiers would know when the enemy is approaching. If you're ever planning to visit the Great Wall, be warned, that it is a lot of physical work. The stones on the wall tend to be bumpy, so it's pretty easy for you to trip on them. In addition, the wall winds up and down the hills, calling for walking up the steep hills. My legs were so tired after walking the wall and we didn't even walk that much. I would suggest that you wear a comfortable outfit and some comfortable, preferably closed toed, shoes. I wore sandals and I was fine, but I know that if you wear some loose sandals, it may be easier for you to trip. I also wore a dress, because it was a loose and comfy dress, so I wouldn't get too hot. Shorts would probably be the best, but since the dress was a good length and nice and loose, it worked for me. Some of the people I traveled with described the Great Wall as "the biggest workout of their life." While I would say that it's definitely a bit of a challenge if you're not super active, as long as you pace yourself and stay hydrated, it's definitely a manageable trip. We walked until about eleven in the morning, so it was only about one and a half hours, but I was still exhausted and very sweaty. You should also bring plenty of water. I drank maybe two bottles of water, but most of my friends that went along with me only brought one bottle with them, which wasn't enough. I was glad that I had extra water in my bag, because it got really hot and all the exercise was definitely calling for hydration. After we went to the Great Wall, we were pretty tired, but we still managed to make our way to the Olympic village. (after eating of course, because I was STARVING after all of that walking) We didn't spend long in the Olympic village, since we didn't enter, but we did look at the buildings from the 2008 Beijing Olympics, the Bird's Nest and the Water Cube. It was kind of nostalgic in a way as we looked at the Olympic village, since it was just about time for the 2016 Rio Olympics. Can you believe that it's been 8 years already? Yikes! 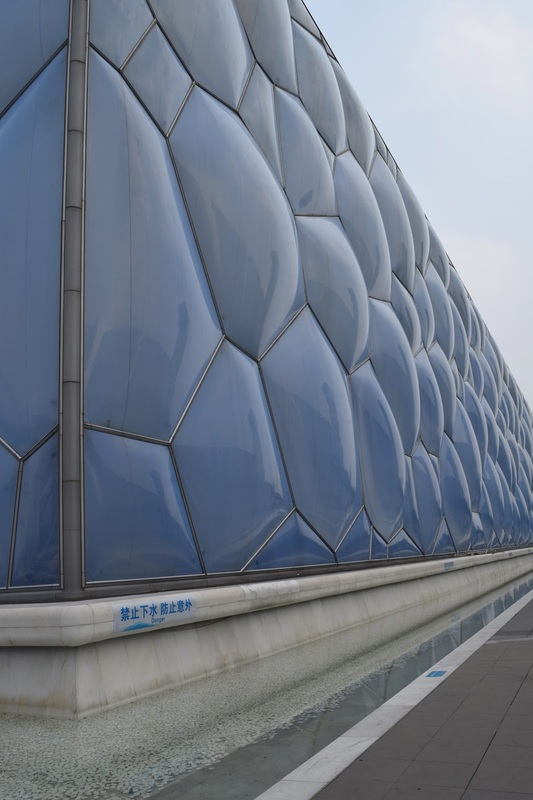 You can go inside the water cube, but it's definitely a pricey visit just to see a pool, even if it was where the Olympics were held. I'm not sure if you can go into the Bird's Nest, but we didn't go inside. In the Olympic village, you could see the hotels where all of the athletes stayed, sculptures, and the buildings. I honestly don't remember much about the Olympic village, I was still so tired from walking the Great Wall. We spent about thirty minutes to an hour there and that was definitely enough time to explore and snap some pictures. I've always wanted to visit the Great Wall- looks stunning!